Bomber is a novel of war. There are no victors, no vanquished. There are simply those who remain alive, and those who die. Bomber follows the progress of an Allied air raid through a period of twenty-four hours in the summer of 1943. It portrays all the participants in a terrifying drama, both in the air and on the ground, in Britain and in Germany. In its documentary style, it is unique. In its emotional power it is overwhelming. Len Deighton has been equally acclaimed as a novelist and as an historian. In Bomber he has combined both talents to produce a masterpiece. The classic novel of the Second World War that relates in devastating detail the 24-hour story of an allied bombing raid. Deighton at his finest. 20+ hours but just couldn't stop listening. Felt like a few hours. High level of factual detail around WWII aerial antics, woven into a fictional story, guts and all. Would you try another book written by Len Deighton or narrated by Richard Burnip? Would you be willing to try another one of Richard Burnip’s performances? What character would you cut from Bomber? I have read the book in paper edition several times and it is a great read. Both my son and myself, trapped in the car for 4,000km across Australia relied on Audible to get us through - Bill Bryson books excellent. The narration on this one put our teeth on edge! 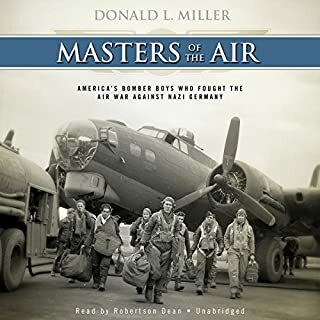 Narrator sounded like he was reading an ABC book to kindergarten, making a myriad of truly awful character voices - the housekeeper to the German Air Force Station Commander was the final straw. Sorry if I offend, but the audible version was horrible, due 90% to teh narration and 10% to the need for a bit of condensing. Is it too long? I wondered halfway through. This book endeavors to put all events of a bombing raid together in a 24 hour time frame. Just like the TV series, it is nearly true to time. But it does work. All the stories are well developed and brought together. Lost one star in making every female character marginal and somewhat silly (this maybe a result the narrator, but is not helped by Mr Deighton, who has written great female characters in subsequent novels). The narrator did an awesome job of giving every one of the characters a recognizable voice and did a fantastic job except for the female ones. Replete with incredible detail, I feel like I was in the bomber and on the ground at the same time. Almost a perfect book, almost perfectly read. Highly recommended! I don't think there was an agenda to this story, although I felt for the victims, none of them were very sympathetic. I still feel that everything the allies did to try to win the war was justified, after all they did not know how it would end, and were really just trying to win a war they did not start, but had to see through. Would you listen to Bomber again? Why? Yes, and I am certain that I will. If you ever want to know what it was really like to be involved in a WW2 night bombing raid from the point of view of all those involved on both sides, read this book! What was one of the most memorable moments of Bomber? There are so many that it's difficult to choose, but the fate of Lambert, the English bomber pilot, after all the raids he has done and everything he has been through sums the whole thing up beautifully. What about Richard Burnip’s performance did you like? He has a measured delivery that does not sensationalise whilst at the same time never let's you get bored. I spend time with WW2 RAF veterans at an annual event and these interactions just make the events depicted in the book more immediate and more personal. I can imagine these old men in their youth going on these raids, not just the one time depicted in this book but several times a week. And they are the lucky ones who made it through. In WW2, RAF Bomber Command aircrew took almost 50% fatal casualties, and hundreds of thousands of German civilians died in the raids they flew. This book makes those statistics very believable. If you could sum up Bomber in three words, what would they be? I can't identify a particular moment. The power here is in the broad scope of a single mission. As Tolstoy presented the broad landscape of the Napoleonic Wars through the intimate details of a large number of different people's lives, so the author paints the details of a large number of people's lives during a single fictitious mission by Bomber Command over the Ruhr. War and Peace covers thirteen years, this covers twenty-four hours (on June 31, 1943). A day in for all flight crews in WW2. Well done showing the lives of German an allied pilots and flight crews. A 24 hours flow of time with the surrounding events showing clearly the horrors of war. Absolutely. In fact, I already have listened to it again. The buildup really pulls you in as you follow the German civilians, knowing what is going to happen to them. And also the pilots as they go about their preparations. This was an incredible book. I listened to it over the course of a weekend and was genuinely sorry that it ended. Plus, the forward by the author is really interesting as he describes his process of writing and researching the book. A rare book balancing both sides of the war. The original 24. A must read. One of my favourite books by one of my favourite authors, this unabridged reading is good value for money but is somewhat spoiled, to my mind, by the narrator. Richard Burnip’s command of accents is acceptable and his German pronunciation, at least to this non-German speaker, seems good. 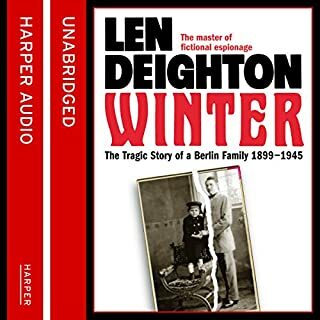 However, Deighton’s technique in this book is to describe the events surrounding a bomber raid on Germany in minute technical detail but in a completely dispassionate way. This has the odd effect, as Deighton of course intends, of emphasising rather than diminishing the sheer horror of the events described. Burnip’s rather slow, over-deliberate enunciation, together with his habit of inserting small pauses where none should exist does not, to my mind, fit well with Deighton’s narrative style and effortless mastery of technical detail. 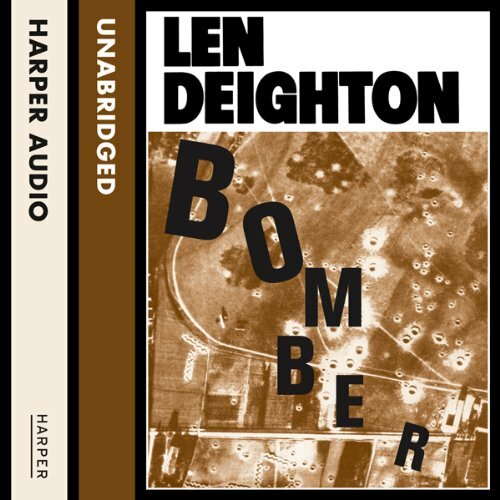 Would you consider the audio edition of Bomber to be better than the print version? I like both formats in this case but I would say that the audiobooks probably brings the characters to life more. It is long time since I read the book though. It gave the characters greater depth and gave them more life and in a lot of cases death. Probably the trapped in the cellar sections. I found it lived up to memories of the original book and though dated in a lot of ways it still brought out the terrible reality of war on people's lives. Richard Burnip.....avoid at all costs! In the preview narration it is no surprise that it is the voice of Len himself rather than Burnip....no wonder, Audible know what they are playing at! Did Bomber inspire you to do anything? Turn off and reach for the paperback! Avoid Richard Burnip at all costs! I wish to look in more detail at the problems of the narration. The basic voice is matey rather than weighty, and slow, which doesn't fit considering the subject matter. The various voices used for dialogue differ only slightly. The first speaker sounds like the basic voice. A second or third speaker speaks a little higher or lower in tone, and often even more slowly. It sounds amateurish, like an unpractised daddy reading a story to children. In places the narration slows even more, and I suspect the reason for this may be that the 'performer' has not read the text he is reading in advance of the performance, so he needs to slow down so that he will not stumble. Finally someone should have told him the correct pronunciation of 'Rathaus' (town hall) which has nothing to do with rats, and the mistake is particularly annoying because there are so many references to it. It started at the beginning and carried on throughout the book. If you could play editor, what scene or scenes would you have cut from Bomber? I read this many years ago, and yes it has dated somewhat and too be honest it was too long-winded in places BUT despite that worth a read. Perhaps because some of the truly terrible scenes, like the seduction early on of Anna-Luisa by Bach (not the famous one) could, I imagine, be skipped. Now I listen to many books and thought I'd revisit it via Audible. A nice long book I thought to listen to while cooking, doing up the house etc. But my God, what a disappointment. I mean truly. The narrator sounds as tho' he has been told he die at the end, and he drags it out, presumably to live, sadly it made me wanted to die. He reads it without any sense of action or excitement. In a way his achievement is actually remarkable. It sounds like the recording has been slowed down, truly. Can you imagine the most boring voice you can imagine, then some, no then a lot. This is a book about a bombing raid over Germany and well there are some slow bits and some action and of course tension. This narrator makes the tense exciting bits sound like someone reading a telephone directory as slow as he could. Was he paid by the hour? The slower bits, well I can't really describe them. He does make the seduction scene mentioned above an absolute scream though - truly funny. I mean buy it and listen, then send it back cos the rest is terrible. 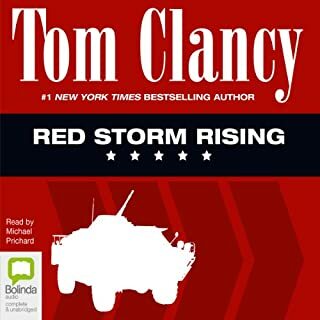 The narrator is a crucial part of an audiobook, and there are bad examples, this one isn't the worst I've heard on audible, but its right up there. I managed to last till the end of part 1, couldn't face opening part 2, so sadly I'm returning it. 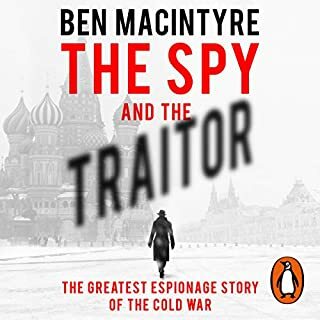 This is a fine thing audible does, although in this case they are culpable because the 'trailer' is not a part of the book and is the voice of Len Deighton. Audible, you could actually do more here. List in under comedy, for the 'trailer' use August Bach and Anna-Luisa's looooooooooooove scene. It'll fly of the shelves. OK in summary I would suggest avoiding, try and get hold of the BBC dramatization to listen to and read the book. Maybe a different narrator. Maybe. Anything that will lighten the mood and feel less wooden. Who might you have cast as narrator instead of Richard Burnip? 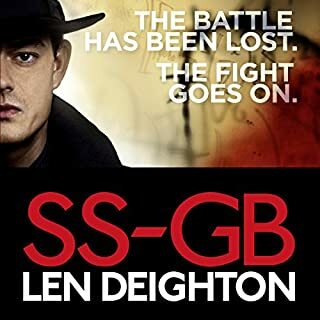 I am normally a huge fan of Len Deighton's writing and devoured my way through the Bernard Sampson trilogy of trilogies, SSGB and Winter but Bomber has me stumped. Such a dour plot and at just over the half way point I gave up for my own sanity. I'm afraid Richard Burnip's reading didn't help - sorry, but not a patch on James Lailey. 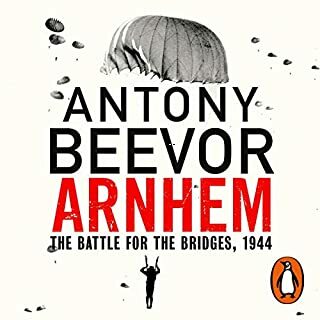 Totally brilliant account of air warfare from both sides,not just horrific and gripping but excellently written delivering a story of love,life,death,bravery,courage,and stupidity all in the period of 24 hours,a must for anyone with a sense of humanity and the futility of war. The story is great but the chapters are a mess. Don’t know what happened but after listening for 12 hours or so, got to chapter 12 and it announces “epilogue” and tells of what happens to some characters after the war. A bit of a mess. Shame, it’s a great book but I won’t listen to the remaining 14 hours as it jumps back and forth. A brilliant and terrifying book. I was glued to it. One thing, I had a problem with the download, the chapters were all mixed up. timely balanced reminder and insight. I remember being transfixed when young, but not why. Len was much maligned, but this shows underappreciated. Technical details brilliant and illuminating, respectful balance matured with age. Well worth reaquaintance for young and old.